Americans devour seven billion hot dogs every summer, but it was an innovative Canadian who came up with a better way to grill them. The Slot Dog. If you want to know how to cook hot dogs like a pro, keep reading. 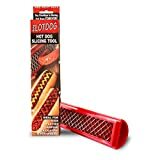 Slot Dog’s blades cut the hot dogs with diamond-shaped cuts. The increased surface area helps caramelize and creates crispy, tasty edges. When you cook them on the grill the scoring releases steam, helping the meat to cook more evenly and making it easier to tell when it’s done. It also stops your sausage from bursting or contorting into a shriveled version of its former self. Another benefit of the grooves is that the ketchup, mustard, relish, and other condiments have nooks to seep down into, so they stay in place. To use the Slot Dog all you have to do is press the blade into one side of the hot dog, then turn it over to score the other side. Since this tool contains blades, do treat it with some care. It is recommended to use skinless sausages since it won’t work as well with casing/skin style hot dogs. Also use cold, firm sausages; warm ones can get squished when you press down. Then you just toss the sausage onto the grill and wait for it to be done to perfection. The grid of the blades are made of stainless steel, and the whole unit is dishwasher safe. What’s the difference between using one of those spiral hot dog cutters? Well, spiral cut sausages stretch out. This makes them lose their rigidity and can easily fall apart when you try to take them off the grill. Cutting them this may also make them expand, so they hang out the bun, while the Slot Dog plumps out rather than stretching. After a few times using it, you should have the hang of it. 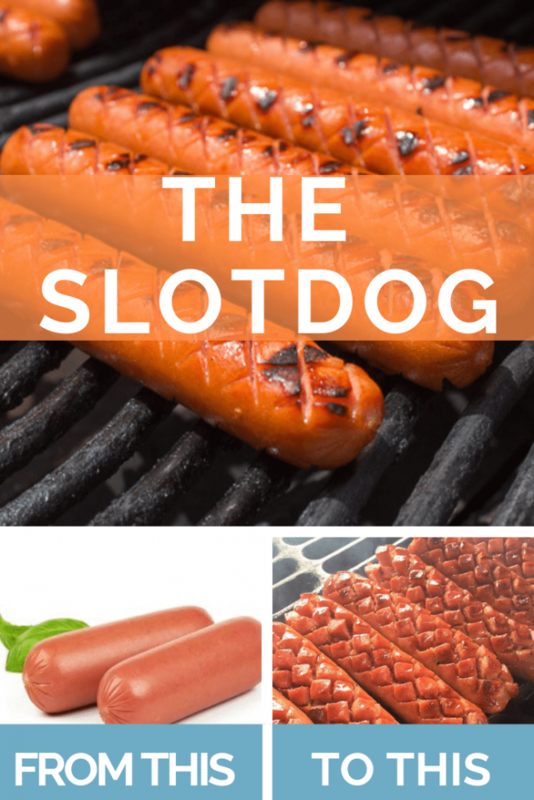 Your tastier crisscrossed hot dogs will be a hit at your next cookout or the next time you grill some for dinner. Best of all, you can get this amazing hot dog effect when cooking in a frying pan, a regular oven, a bbq/grill, a smoker, or even a campfire. Say Goodbye to Boring Hot Dogs Forever!